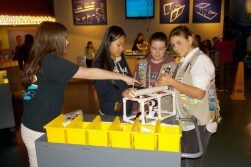 Want to help young girls explore the world of STEM? The Gwinnett Girl Scouts are hosting an expo of female-focused leadership programs covering environmental responsibility, STEM, financial literacy, health and wellness and much more are promoted through Girl Scout activities and events. The Gwinnett Great Days of Service project will take place on October 21st, 2017 from 9 am and volunteers are needed to help with a special STEM event at the Gwinnett County fairgrounds. They will help welcome, monitor flow lines to booths, help deliver fun, games and prizes to the girls and, at the same time, learn much about this great work done with our girls! *Project will take place come rain or shine! For this project and the many opportunities for Gwinnett Great Days of Service, please access our projects at this LINK!